Before settling down the dust of tenth bank bipartite, Ministry of Finance initiated next wage revision process. This is as per the recent Govt. policy of effecting wage revision from current date to avoid any financial burden of payment of arrears. Recently we noticed this approach for Central Govt. employees where pay commission had been constituted well in advance, for the first time in history. 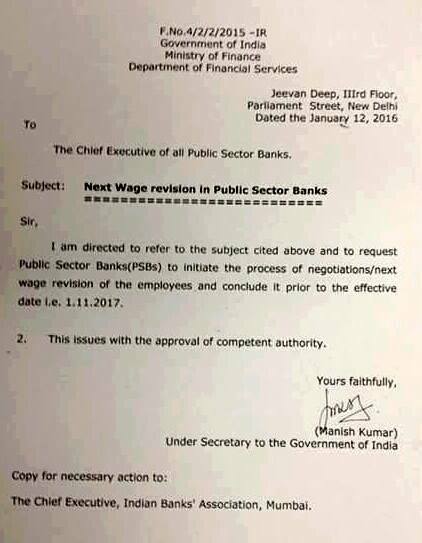 Finance Ministry vide its Letter No.F No 4/2/2/2015,IR dated 12th January 2016 directed,CEOs of all Public Sector Banks to initiate the process of negotiation /Next wage revision of the employees and conclude it prior to the effective date 1.11.2017. The last Wage revision process due w.e.f 1.11.2012(10th Bipartite Settlement /Joint Note was completed on 25th May 2015 .